Ernesto Valverde has dismissed any fears of more VAR controversy when Real Madrid host Barcelona in the Copa del Rey semi-final second leg on Tuesday. Madrid won 2-1 at Levante on Sunday thanks to two goals from penalties, both of which were awarded after a check with the video assistant. The second spot-kick was particularly controversial, with Cheick Doukoure penalised for missing an attempted clearance and kicking Casemiro, who went to ground under minimal contact. Valverde, though, is not worried about such problems when his side visit the Santiago Bernabeu for the first of a Clasico double-header this week. "We're quite calm about all of that," he said when asked about VAR. "We know controversy is always going to be part of football and other sports. The controversy often depends more on people than the sport itself. We're just going to concentrate on trying to win. "Obviously, we have to go and try to hurt the opponent because that's how we always like to play. If we don't score, we've got no chance of going through, so we've got to try to score. But we'd do that in a Clasico or any other game. "We have to protect ourselves against Real Madrid's strengths - that's obvious." , , , , , and ! #Messi's best goals at the Bernabéu! When pressed on the Casemiro penalty, an incident which left Doukoure with knee ligament damage after he fell awkwardly, Valverde said: "I'm not saying anything about that. We just hope he recovers as quick as possible and I mean that with no irony whatsoever." The match will be Valverde's 100th in charge of Barcelona and gives him the chance to build on their impressive recent away record against Madrid, which has seen them win four of their last five league meetings in the capital. "I don't really take any notice of those things," Valverde said of that run. "Barca played very well at that ground in recent years but it really means nothing for [Wednesday's] game. It'll be a great game. I don't take statistics too much into consideration. "I'd love to celebrate [100 matches] with a win, of course. It's a big game, a semi-final and also a Clasico. We don't know what's going to happen, but we know it'll be difficult. "We're not going into it with the best first-leg result, but the tie is still wide open. We're playing a very difficult opponent." Valverde hopes their 4-2 LaLiga win away to Sevilla at the weekend stands them in good stead for Wednesday's game and the league meeting with Madrid on Saturday. 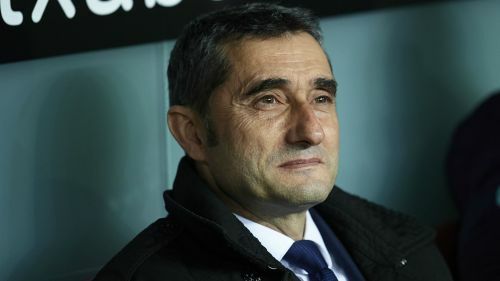 "Going into a game like this one or the Champions League, it's always good to be in a winning streak," said Valverde, whose side drew 1-1 with Madrid in the first leg. "Winning away from home, scoring four goals against a really tough team, it was a big boost for our confidence."